The Ziggy reminds us of a zipper or stitch that radiates around the ribbon. Very masculine and understated but with great style! personalized dog collar, earth tones, brown, rust, tan, burgundy, navy blue, warm colors, boyish, brawny dogs, muscular, ribbon dog collars, awesome, distinctive, stylish, distinguished, male (masculine, for a boy dog), pretty, handsome, designer fabric, cloth, design, handmade in the US, custom, handcrafted, personalizable, cotton, nylon, dog collar and leash set, adjustable collar and lead, custom engraved buckle, non-leather, latest fashion, fashionable, decorative, strong, durable, tough, for small dogs, for medium dogs, for big dogs, and for giant dog breeds...! Dog Collar Ziggy. For Tough Dogs. For Big Dogs. And for Small Dogs, with a Big Attitude. Handmade Designer Dog Collar with custom engraved buckle to personalize it with your dog's name and address, ID info. Tough dog design with zipper like stitches. Small, Medium, Large, Extra Large. 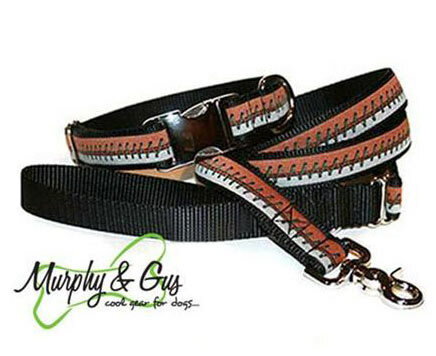 Flying Dog Collars, Murphy and Gus collection. For small, medium, large and extra large dogs, up to neck size 28 inches! , personalized dog collar, earth tones, brown, rust, tan, burgundy, navy blue, warm colors, boyish, brawny dogs, muscular, ribbon dog collars, awesome, distinctive, stylish, distinguished, male (masculine, for a boy dog), pretty, handsome, designer fabric, cloth, design, handmade in the US, custom, handcrafted, personalizable, cotton, nylon, dog collar and leash set, adjustable collar and lead, custom engraved buckle, non-leather, latest fashion, fashionable, decorative, strong, durable, tough, for small dogs, for medium dogs, for big dogs, and for giant dog breeds...! 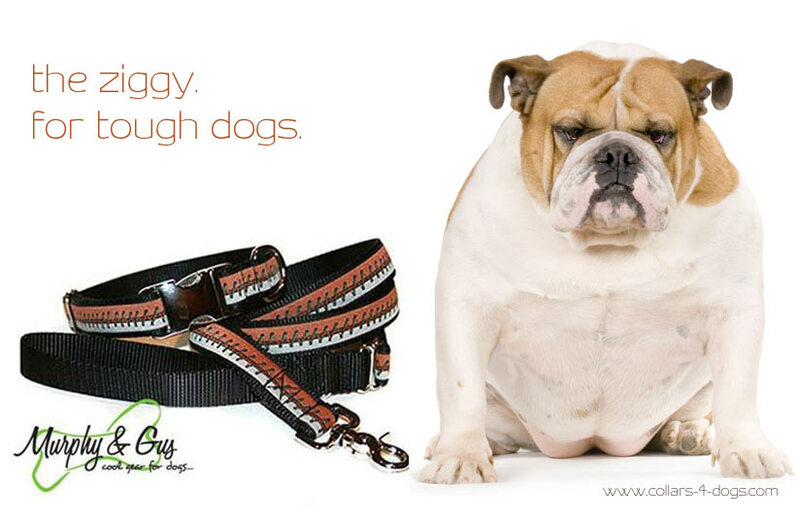 The Ziggy dog collar for English Bulldogs. Designer dog collars and leashes, personalized dog collars and leads. Small dog collar (S, XS), Medium dog collar (M), large dog collar (L), extra large dog collar (xl, xxl). Available Neck Sizes in inches: 10 inch, 11 inch, 12 inch, 13 inch, 14 inch, 15 inch, 16 inch, 17 inch, 18 inch, 19 inch, 20 inch, 21 inch, 22 inch, 23 inch, 24 inch, 25 inch, 26 inch, 27 inch, and 28 inch.